This is Part 2 of 2 of CompTIA A+ Objective 5.1 for Part 1 of 2 click here. Safety in Objective 5.1 Given a scenario, use appropriate safety procedures. Enjoy! Always be absolutely sure that that your unit is completely disconnected from the power source before you begin any internal service. It is also good to discharge any energy stored in the components. After unplugging the unit hold the power button down for a few seconds. This will cause the PC to initiate the boot process. Without a power source, the unit will not boot but will dump any energy stored in the capacitors. Performing this simple procedure will reduce the possibility of any electrical shorts or harmful accidental discharge. Remove your jewelry before any electronic service. Doing this will eliminate the possibility of damage caused by shorts and accidental discharges. You will be safer and so will the unit you are working on. If you have an ID badge around your neck or even a necktie, be sure to tuck it inside your clothing while you are servicing. You don’t want to catch on any mechanical components like fans or optical drives. When lifting take a second or two to consider the weight of the object its location (floor, desk or shelf). Now think about the best practices for lifting. For example, keep your back straight and use your legs to lift. Use leverage instead of muscle. A little forethought can spare you weeks of pain. Your job description could cover lifting minimums but you will see that rarely is there a maximum limit. Here again, planning will give you the opportunity to perform the task without injury. Plan for items like carts or hand trucks to help manage heavy weights or long distances. In the event of an electrical fire, you should make every effort to remove the power. Many fires are a result of someone bypassing or ignoring simple electrical safety procedures.For example, don’t overload the outlets. Use extension cords as a temporary solution only and never plug one extension cord into another. Examine the plug and cord of a device for signs of wear and replace before using. Never run a cable of any type under a rug or mat. Fire safety codes require fire extinguishers of the types indicated in specific locations. Electrical fires can be either of two classes depending on their state. When energized the fire is Class C, then once the power is removed it becomes the class of the burning material i.e. 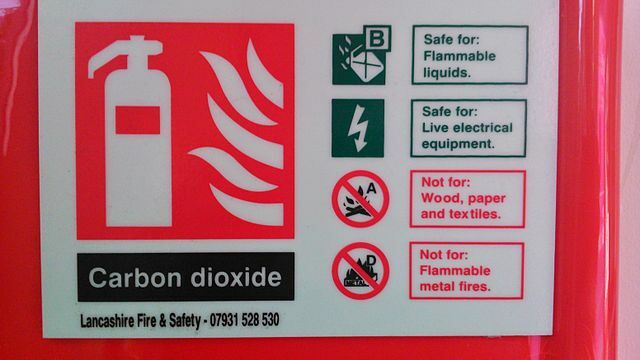 plastic or Class B. here is a clearly labeled Carbon dioxide fire extinguisher. A moment ago we mentioned that you should not run cables under rugs or mats. Then how do you keep people from tripping on cables? You don’t run them across the floor, period. There is no condition that justifies running cables across the open floor or walkways. Bundle cables together using Velcro straps or zip ties. You should be in the habit of wearing eye protection at all times in the workplace. Choose the right style for the type of protection you require. Safety eyewear has impact resistant properties and there are designs that offer additional protection against chemical splashes and airborne contaminants like dust or laser printer toner. 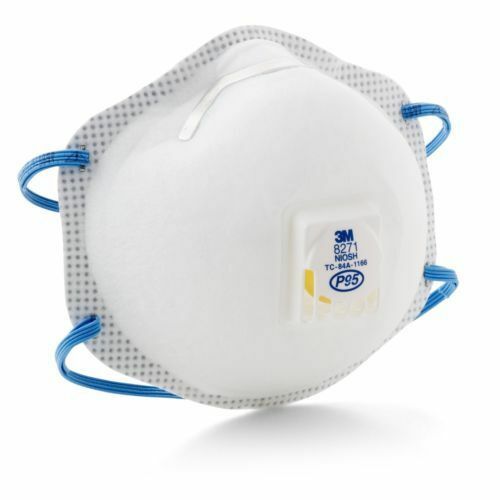 In a dusty or dirty environment, you should always protect your lungs. Irritants suspended in the air may be invisible. You will be able to see the effectiveness of a filter mask by examining the mask after a period of use. Any particulate matter filtered out of the air will be visible on the mask. You may be surprised. When you are in the workplace keep in mind that certain activities like cable routing and disposing of hazardous waste are regulated under local codes or ordinances. You should be aware of these regulations in order to comply with them. And that concludes our ExamNotes for objective 5.1. Good luck on the test! Just wondering what the FIRST step in replacing a power supply is according to the A+ 902 exam. We were taught at TIA that the FIRST thing is to remove jewelry. That answer was even reinforced by their practice exams that they created. Believe it or not, I had TWO questions asking “What is the FIRST thing…” and both had the answer “Remove all jewelry”. I have no idea if “remove jewelry” turned out to be the correct answer, but I did not pass the test so I’m looking for the best and most accurate info possible. Do you have any insight on this question and answer? That is a very good question that allows us to illustrate one of the important characteristics of CompTIA exams. Removing any jewelry protects the technician and is imperative when working inside PCs. It is certainly one of the first steps. Questions like this are relative to the situation you are put in. CompTIA won’t put you in a position where there is no clearly correct answer. So, we can say before you open the case disconnect power and remove jewelry, but in all fairness, you can unplug the computer with or without jewelry. The bottom line is that, as it is with many CompTIA questions the correct answer is contextual. Looking at above order, a question could arguably read “What is the first thing you do before working on a machine?” and the correct answer would be “Disconnect power before repairing PC”. If, on the other hand, the question reads “You are just about to start working on an unplugged machine on the bench. What is the first thing you do before working on this machine?” Now the correct answer would be “Remove jewelry”. This is why it is so important to read any CompTIA question carefully as the context will sometimes change what a correct answer is. It is the failure to do this that leaves some candidates with a feeling of randomness about the correct answers on these tests. Of course, this situation applies to many questions beyond just the jewelry one. Thank you very much for the reply! I thought there was a .001% of getting a reply so I really appreciate you taking the time! I will have to review the questions and try to understand the context. I do see what you are saying about how it can be worded and may be a big part of why I did not pass. I studied so much that when I saw key words in the question, I automatically jumped to the answer. Next time I will certainly read each one very carefully!